September's sewing instructions for the Midnight Mystery Quilt hosted by Cheryl @ Meadow Mist Designs were to make square in a square units. Here are my 34 square in a square units. 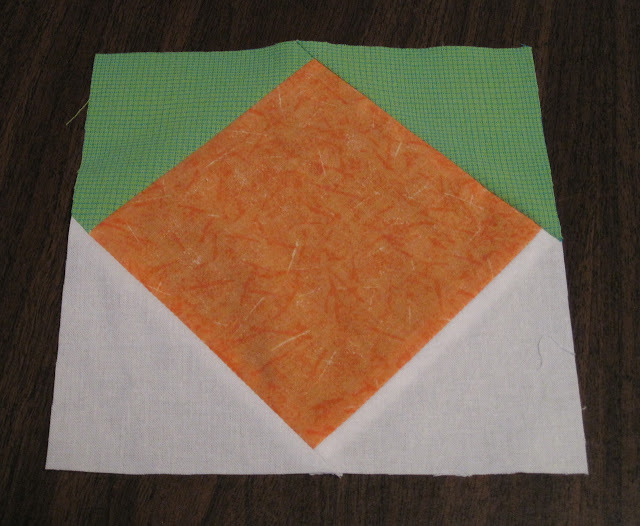 I love orange, so I'm glad it ended up being in the middle of the block. They need a tiny bit of squaring up. But at least they are bigger than the required 6.5 inches and not smaller. August's sewing instructions were flying geese. I wonder how the geese will play with these new blocks. 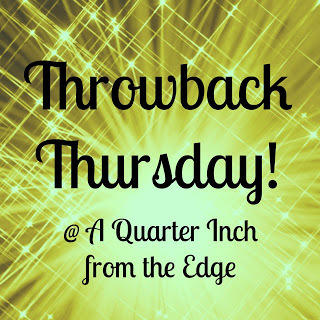 There's still time to join in if you want to play along with us. 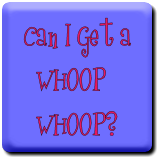 Pat on the back for another project finished!! 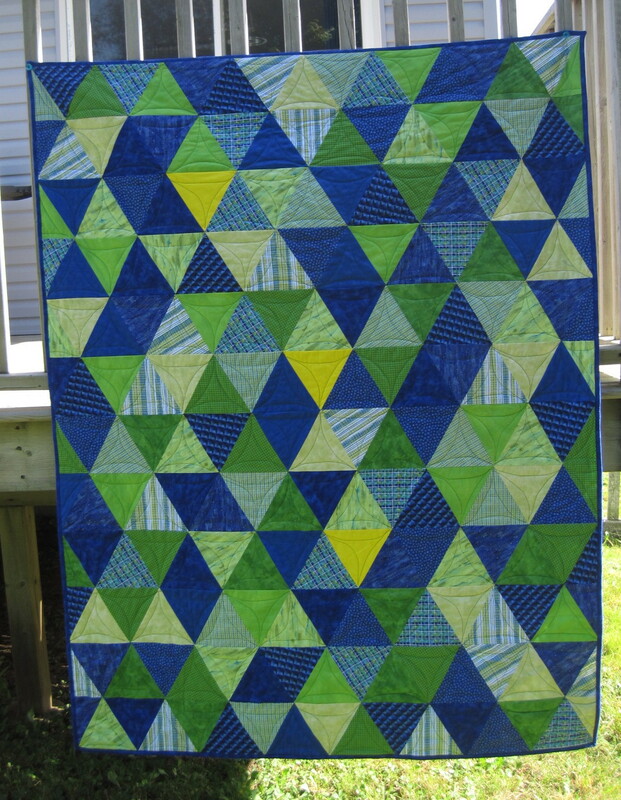 My ALYOF September goal was to piece and quilt my Triangle quilt. It was difficult to take photos today because it was so windy. I kept hollering at the wind to stop (like it could hear me), but it calmed down enough for me to capture these. For those keen-eye Kona lovers, that's Citrus thrown into the mix for fun. I had some leftover triangles, so they were added to the back. 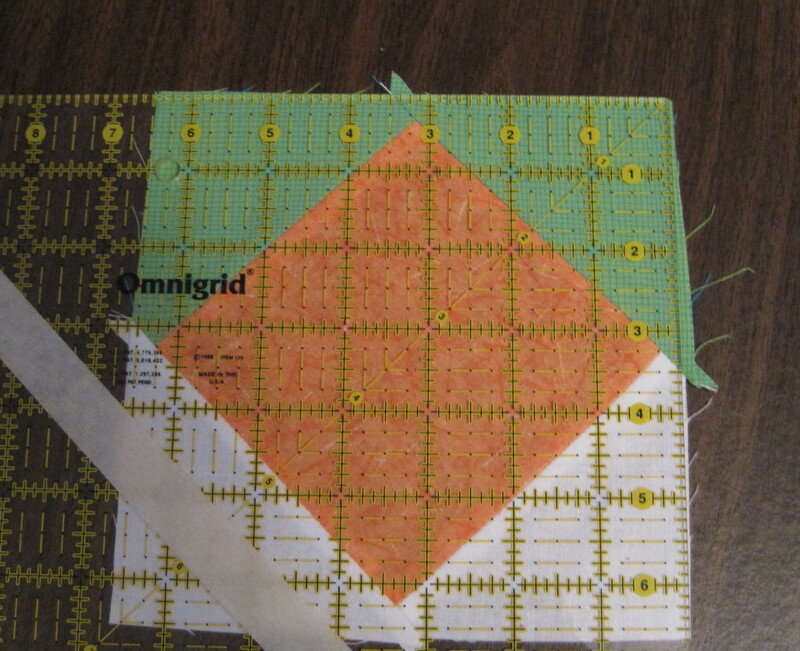 I broke out of my comfort zone and tried some dot-to-dot free motion quilting. 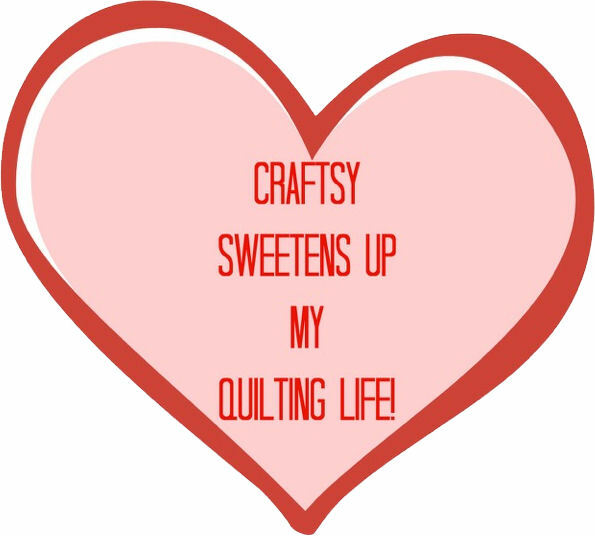 My lack of skills in piecing curves transfers to quilting...pretty stressful at times trying to keep my speed even and to make a curve. Lots of wobbly stitches on the front, but the back looks awesome. 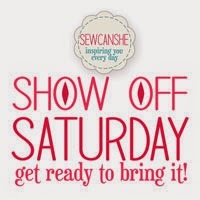 Linking up for the ALYOF September finishes party over at Sew BitterSweet Designs. 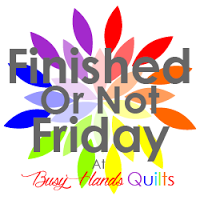 Today's Friday Finish is brought to you courtesy of a Bee swap. 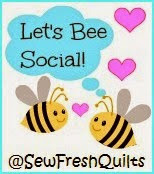 The Do Bees is the first bee I joined, and currently there are five members. 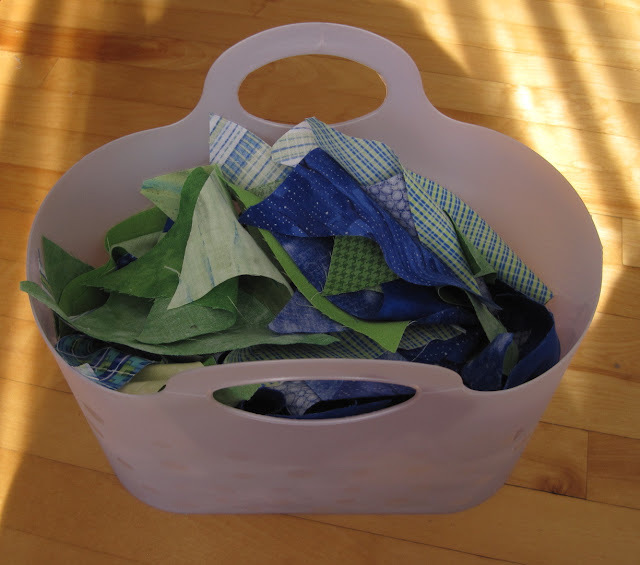 At the end of May, we each bundled four fat quarters. To keep the mystery, we each drew a number and put that number on our bundle. 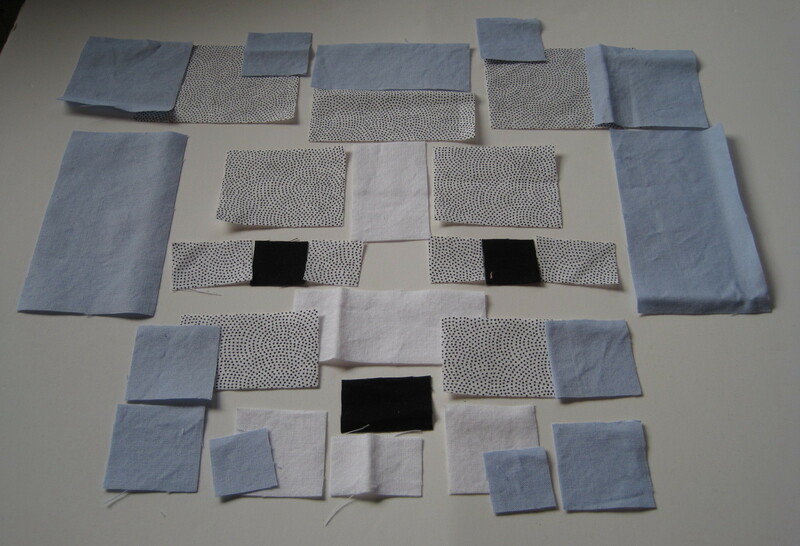 The bundles were put into envelopes, and we each drew an envelope, not knowing whose fabric we had chosen. 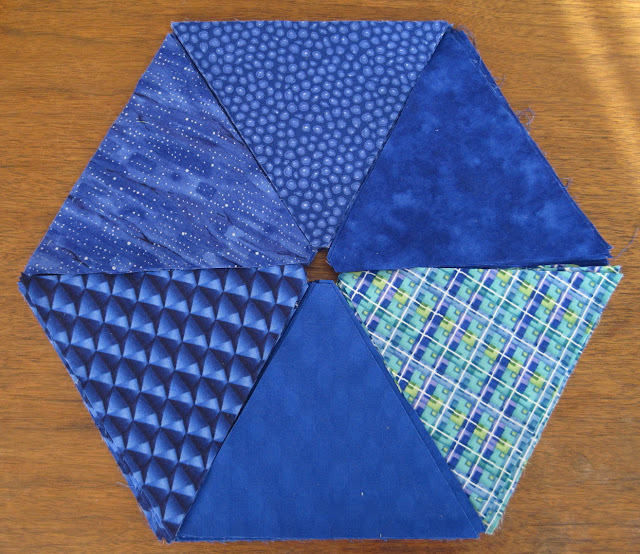 We had until our September meeting to make something with the four fat quarters. I made what I thought was a very educated guess on whose fabric I had. So I went on faith and made something that I knew my Bee mate wanted. I knew Jenn @ A Quarter Inch from the Edge wanted an iron caddy. 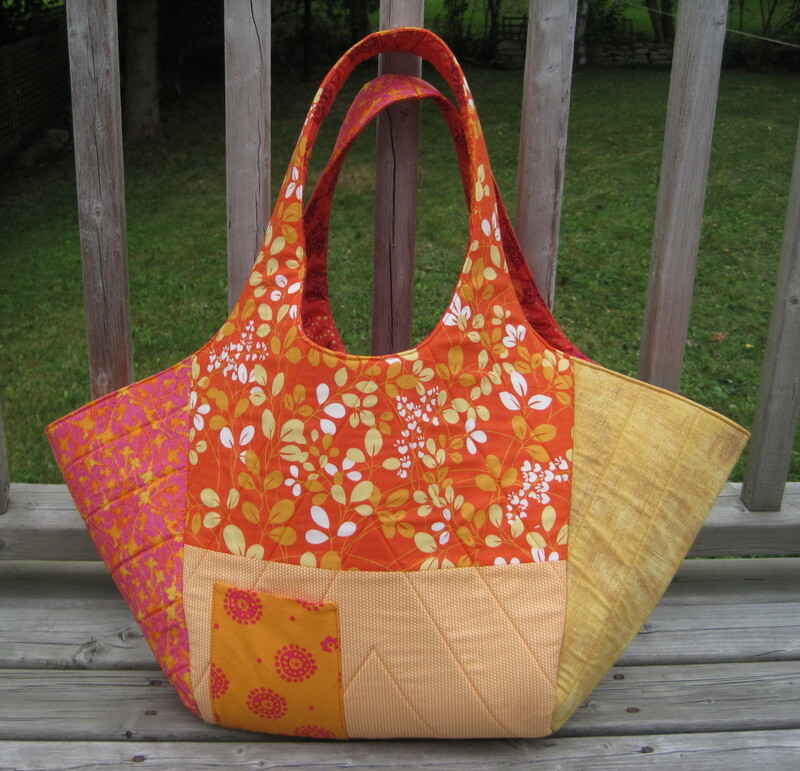 This is pattern from Sisters' Common Thread. It's a combination carry case for your iron and an ironing pad. Jenn has an Oliso iron, so I had to upsize the pattern. Picture a text message to Jenn's husband asking him to measure her iron. I knew he thought I'm crazy, and his response clearly showed it. But he did get the measurements to me. Thanks Himself!! 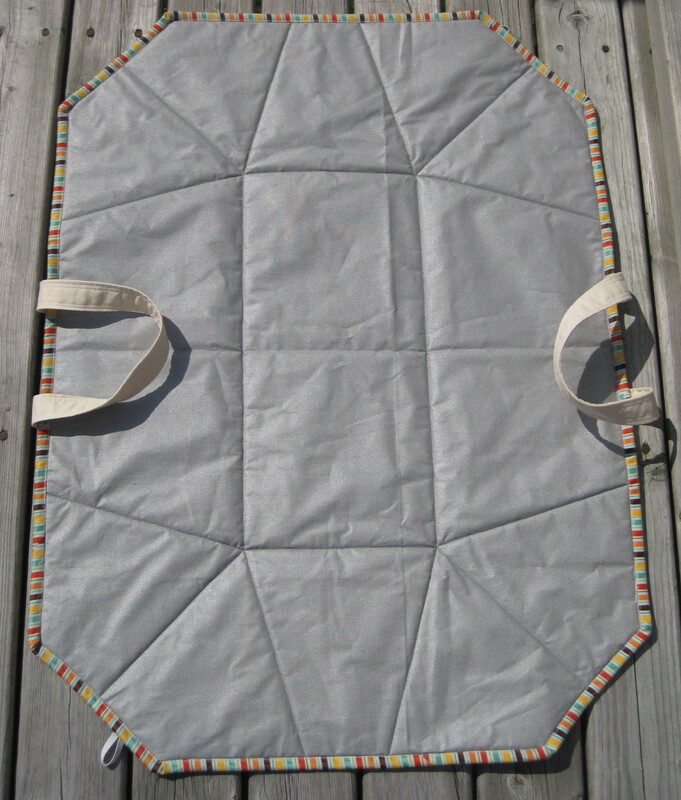 The exterior is cotton, and the inside is heat resistant fabric that you use as an ironing pad. In return, I received a great tote bag made by Ann. There's ton of space inside to hold lots of goodies. Well, these dogs are so darn cute!! 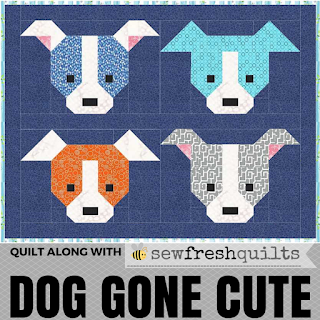 Dog Gone Cute! 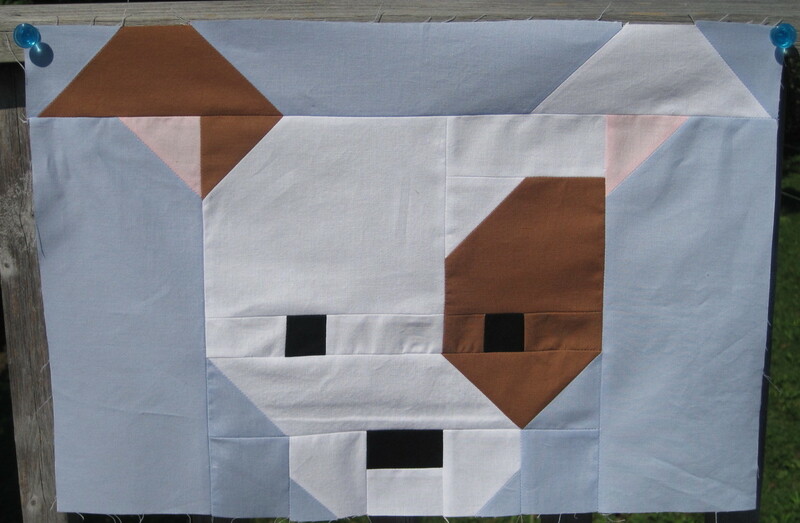 Kudos to Lorna at Sew Fresh Quilts for yet another amazing animal creation. There's still time to play along with the Quilt Along. 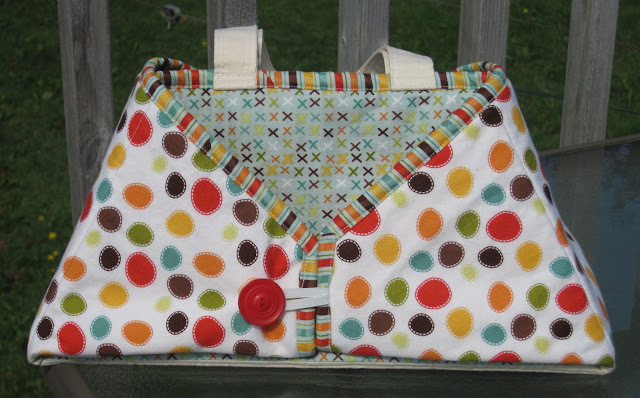 You know you want to play along, so just pull some fabric and get sewing. 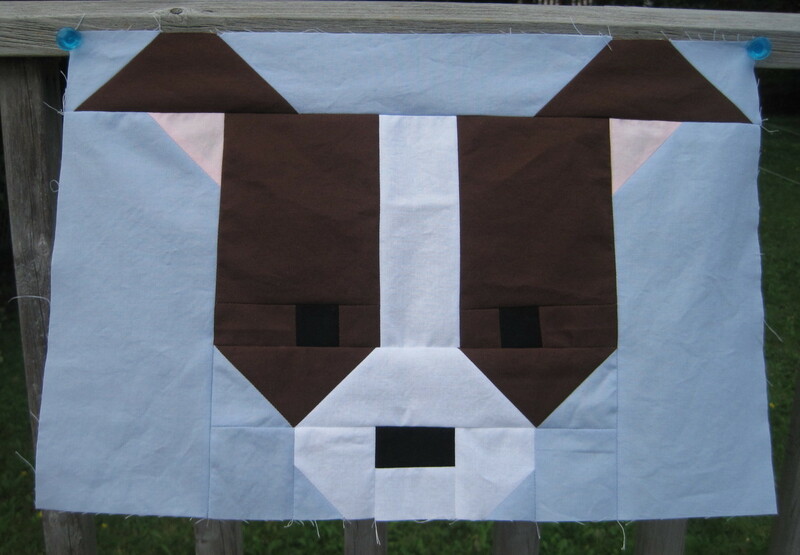 Here's my finished small Dog #5. I'm happy with the fabric I choose for his face. But I'm not a fan of the small block -- too many 1-inch and 1.5-inch pieces. And I didn't think about using my new starch until I was finished. Here's Dog #1 and Dog #5 hanging out together. I decided to make Dog #3. I like this version, but I think the other two are my favourite. Now I need to decide what I'm going to make. 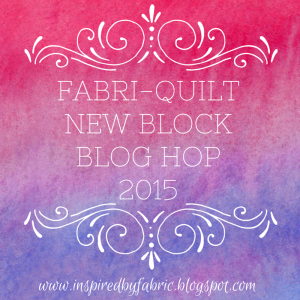 My turn on the blog hop is fast approaching. I had great plans to have a Friday Finish for TGIFF, but as the saying goes, the best laid plans go awry. I took a vacation day yesterday to do some sewing. The morning was spent finishing a project that I'll share with you soon. 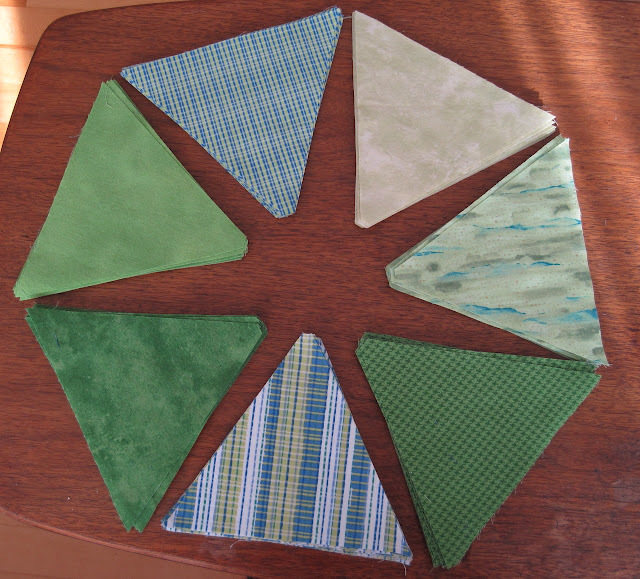 The afternoon went downhill as I attempted to FMQ on my longarm. I was having thread issues, which I suspect were operator error. 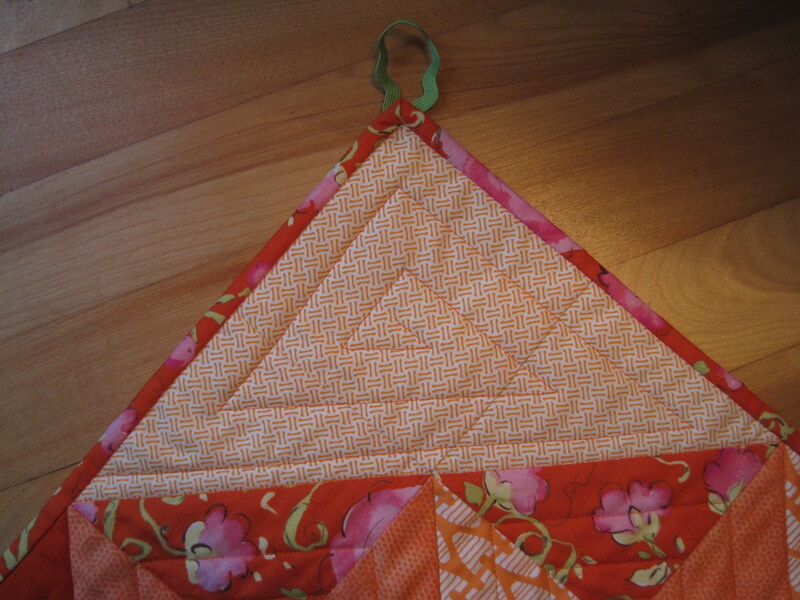 I changed the tension and tried to slow down my quilting (yes, I am a speed demon). Finally...success....but by then it was late, and it's difficult to take photos in the dark. I started this baby quilt last week. 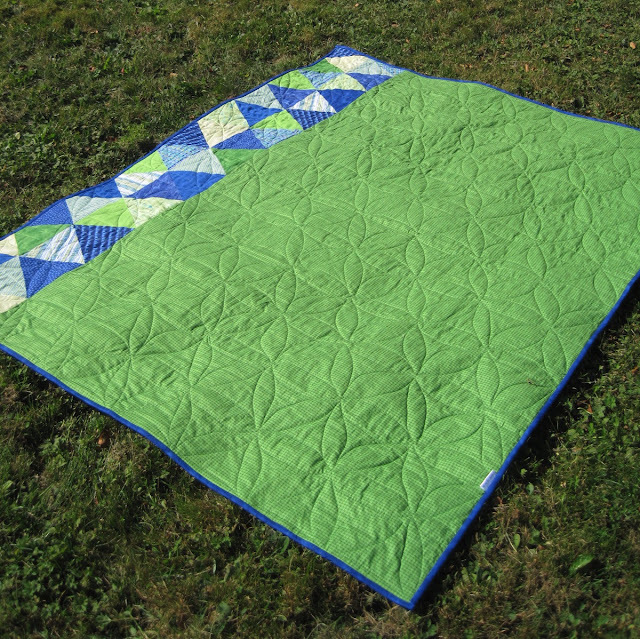 But since I was using yardage, I was able to piece two baby quilts. 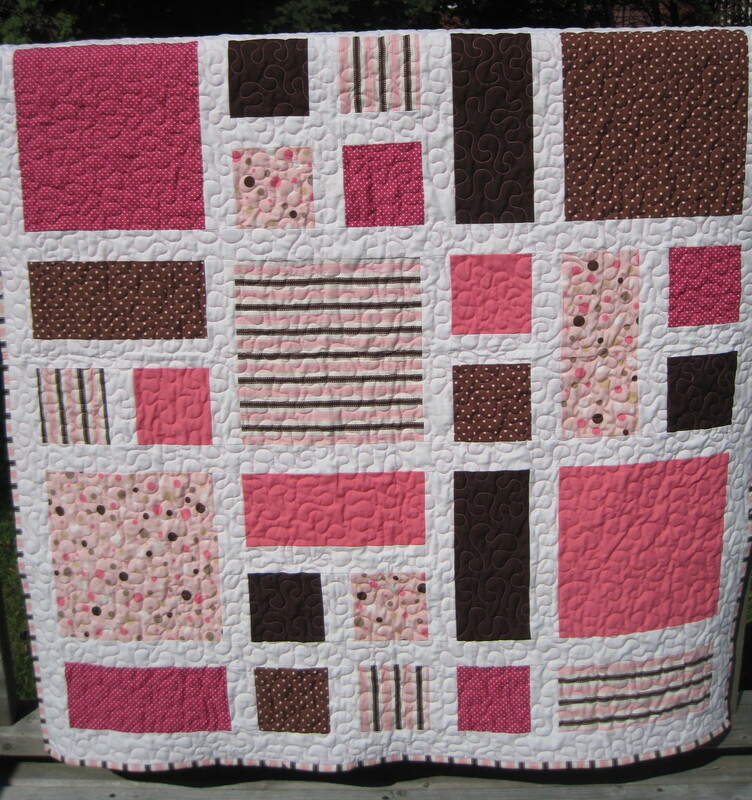 I used Essential Quilting Thread in Sweet Pink. It stands out, but I really like it. Baby quilt #1 will be delivered tomorrow. Baby Quilt #2 will stay in my pile for when I need a baby quilt. 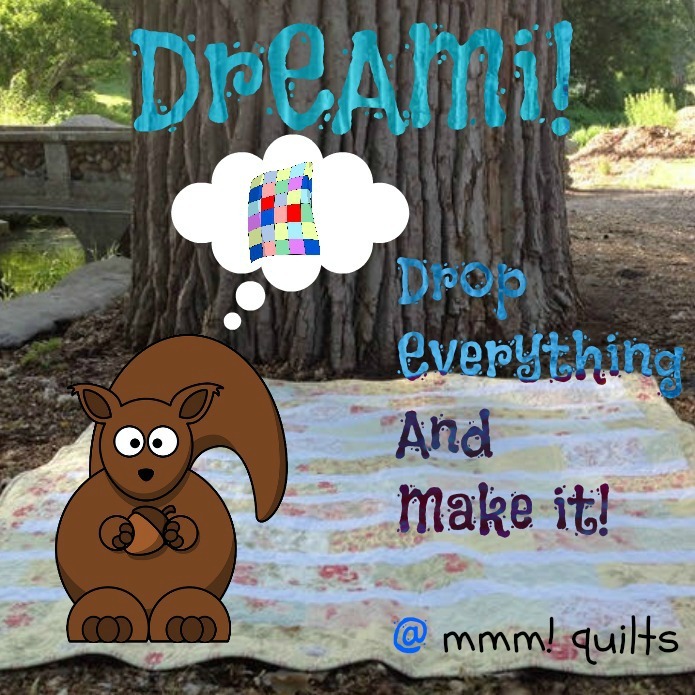 If you haven't seen Lorna's newest animal creations, you need to hop on over to Sew Fresh Quilts. 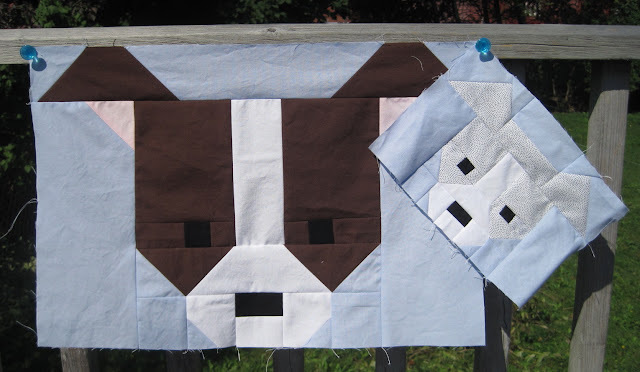 I'm participating in the Dog Gone Cute blog hop, and here is my first update on my blocks. There are two dog sizes and several versions of each. I decided to start with the large Dog #1. My Kona dog is made with Chocolate, Pink, White, and Black. The background is Bluebell. 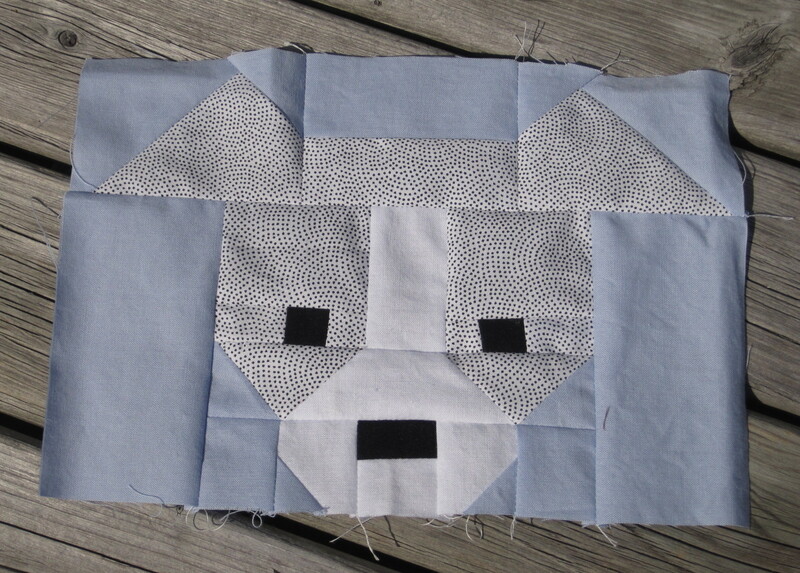 My next block will be a small Dog #5. 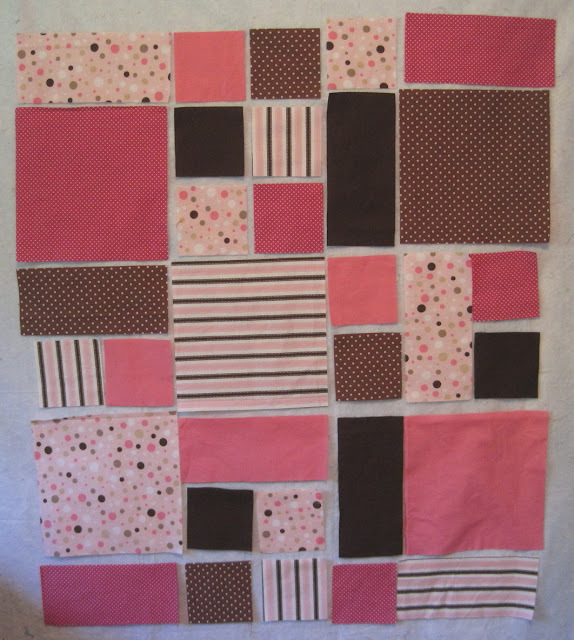 I haven't yet decided what to make with the blocks, so I'm trying both sizes. It's not too late to join the fun. 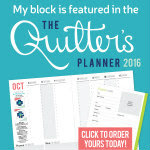 Lorna is generously offering tutorials for the blocks, but you can buy the pattern if you want all the information in an easy printer-friendly document. 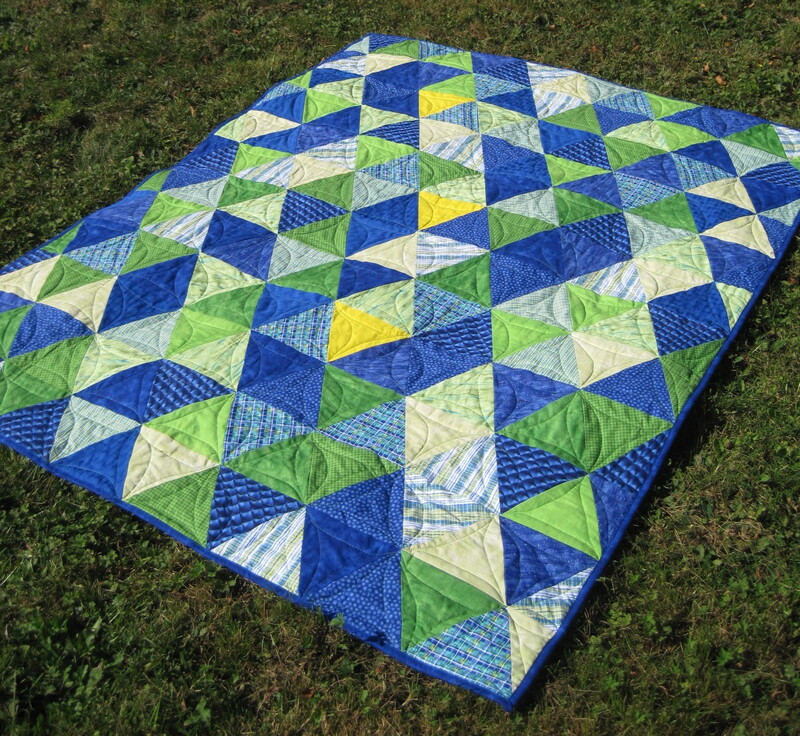 The Maritime Modern Quilt Guild hosted a mini swap this summer. In July, we received the name of our swap partner and her likes. The finished mini quilt was due at the MMQG September meeting. 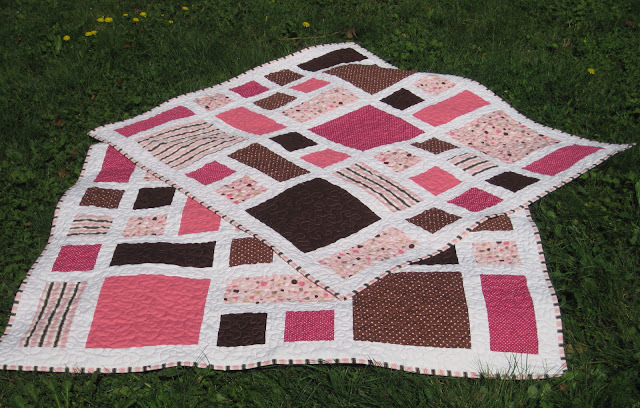 The mini quilts had to be a minimum of 50 inches all around and a maximum of 100 inches all around. My partner was BM, and her likes were: stars and bright intense colours such as red, orange, yellow, purple, turquoise, and black. 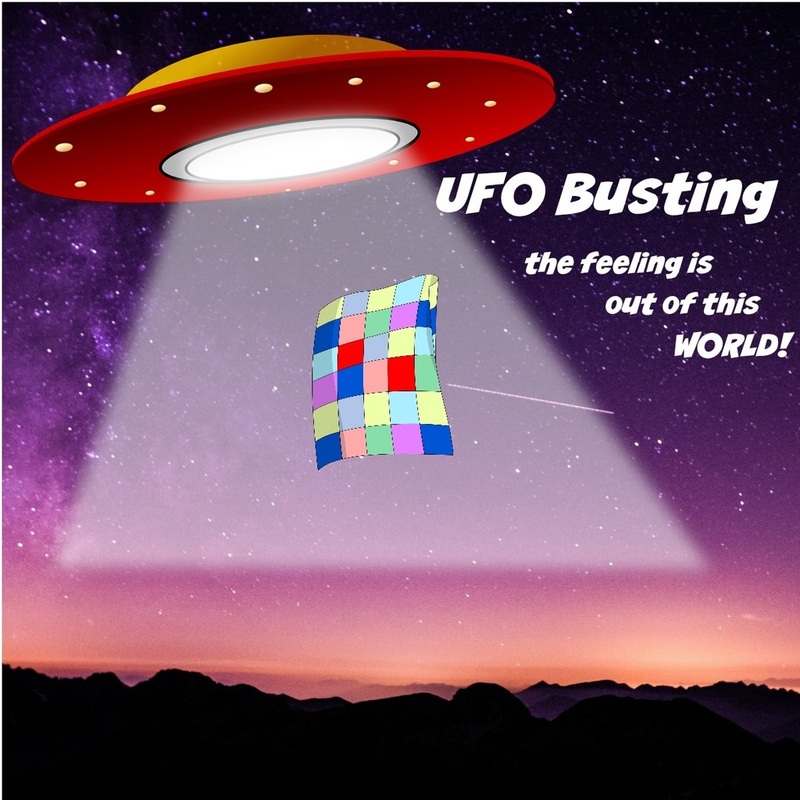 I had a vision based on a pillow created by Ruth @ Charly & Ben's Crafty Corner. 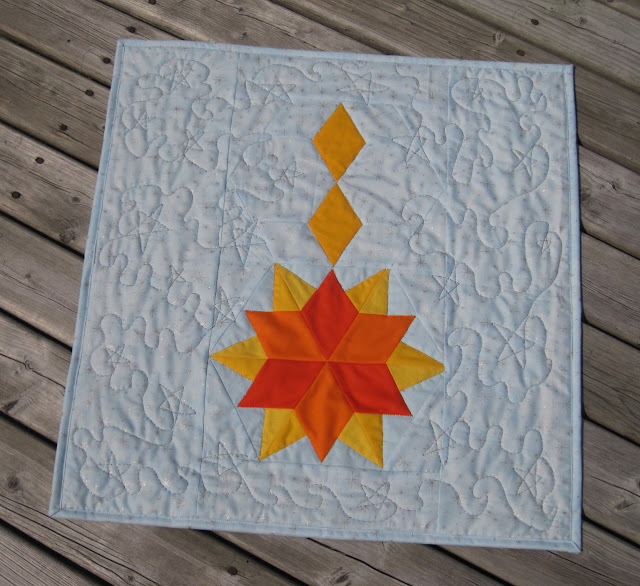 I created the star from Jaybird Quilts' Night Sky pattern. I decided to use Kona for the star: Torch, Tangerine, Sunny, Corn Yellow, and Baby Blue. 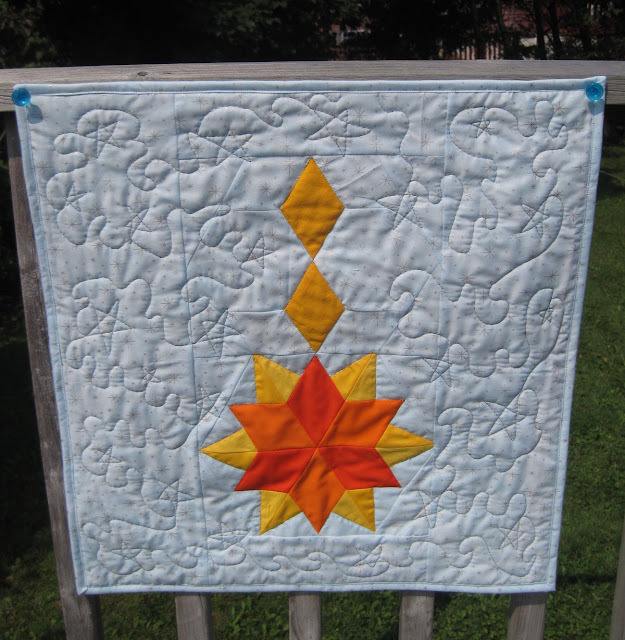 I also attempted some star FMQ. I am very pleased my creation. I even gave it a name: Falling Star. Here's a close up of the great quilting. Thanks BM! This WIP is for a new baby girl due to arrive in November. 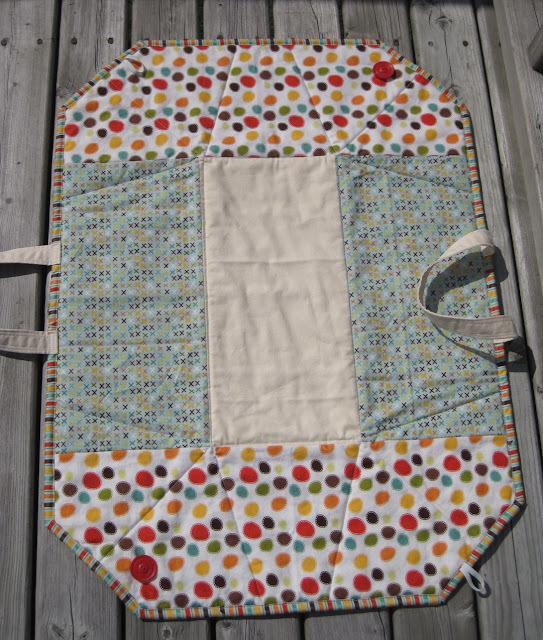 Lynn over at Buttons Quilts makes a lot of baby quilts. 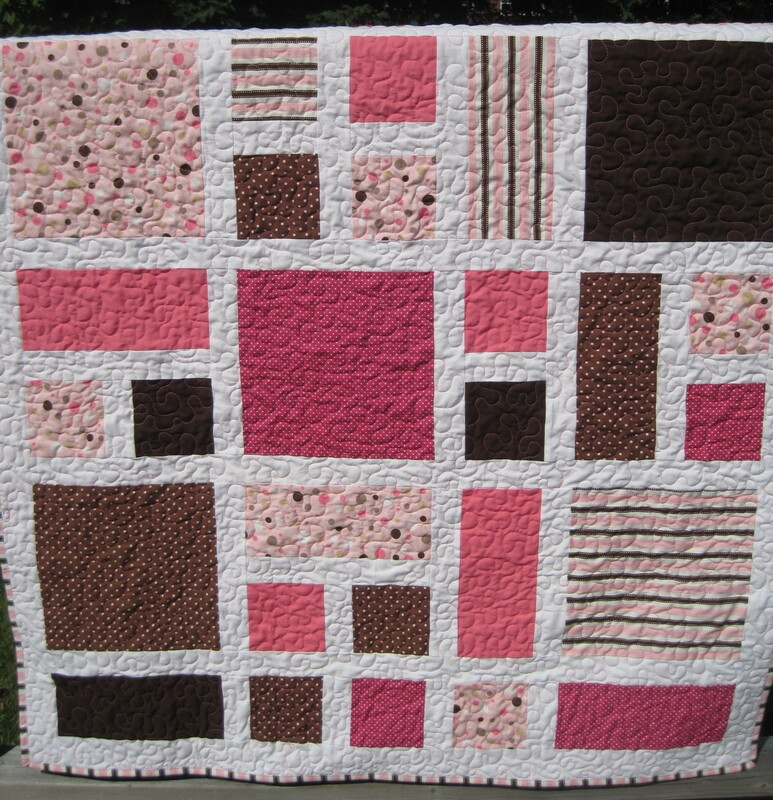 I don't think I've ever seen her make a quilt that wasn't for a baby. I wonder if there is something in the water in her city -- she knows a whole lot of people having babies. Lynn uses a lot of great patterns, so I've decided to try one of them -- Zebra Parade pattern from the May/June 2014 issue of Quilty magazine. 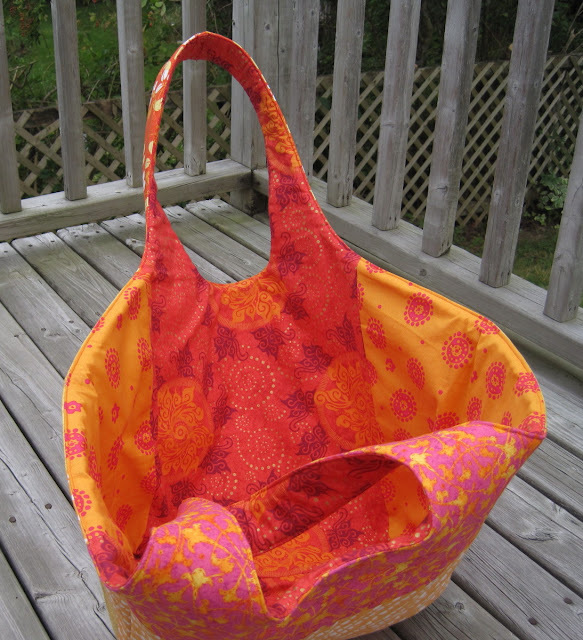 The pattern calls for eight fat quarters, but I used yardage of six fabrics. I've managed to lay out the pieces on the design wall (minus the sashing pieces). Hoping for a quick finish for this one. For the Kona badasses out there, that's Chocolate and Camellia. J The rest of the prints are Robert Kaufman Pimatex Basics, Screen Print. It's once again time to set my monthly A Lovely Year of Finishes goal. 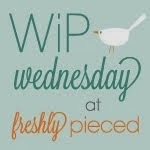 This WIP has been outstanding for some time. 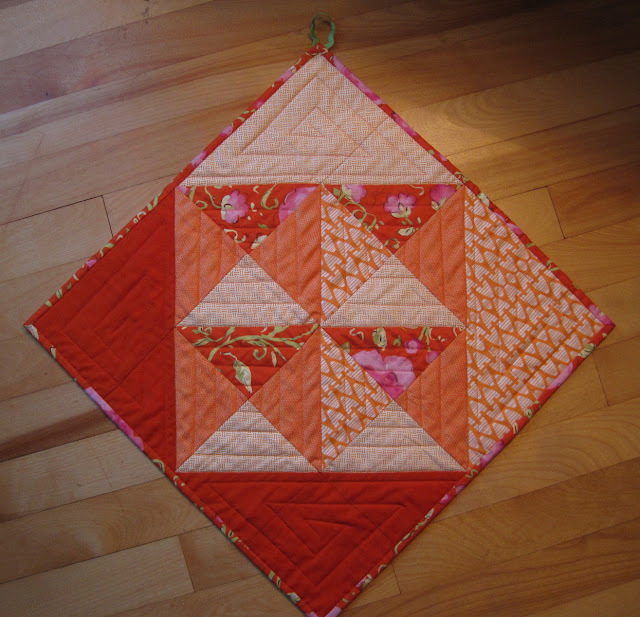 The Sassy Quilter hosted the Triangle Quilt Along back in February 2014. 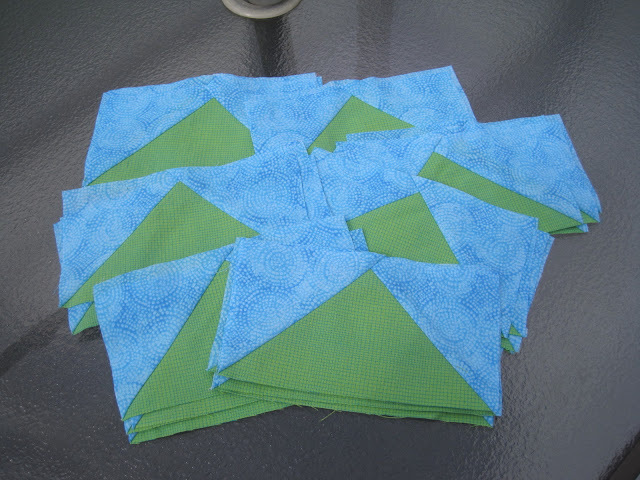 I can't believe the triangles have been cut and ready to sew for such a long time. 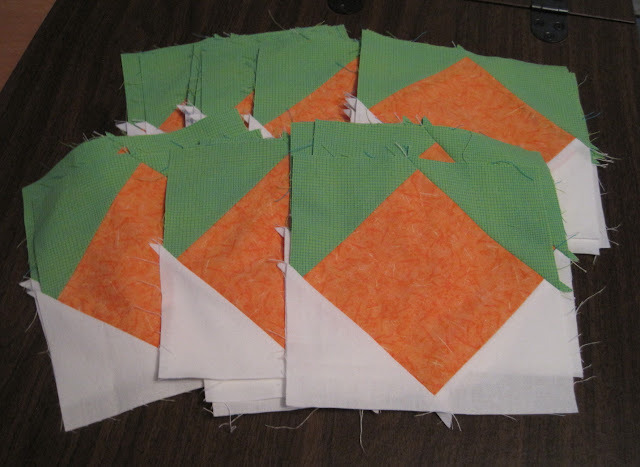 It's high time these triangles get sewn together. My goal for September is to piece and finish this triangle quilt. I think part of the delay was that I didn't want to lay out 204 triangles on my design wall that is not big enough to hold that many triangles. 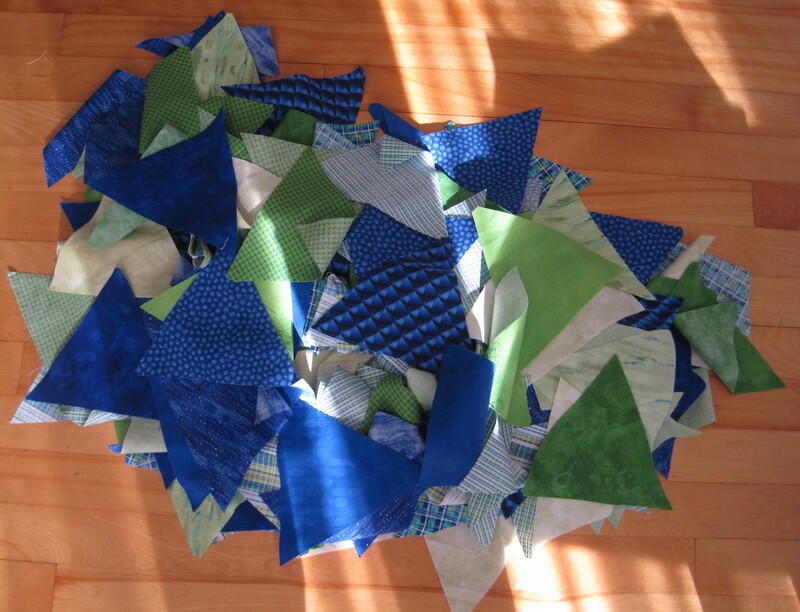 So I've decided to go outside of my comfort zone...a scrappy quilt it will be. 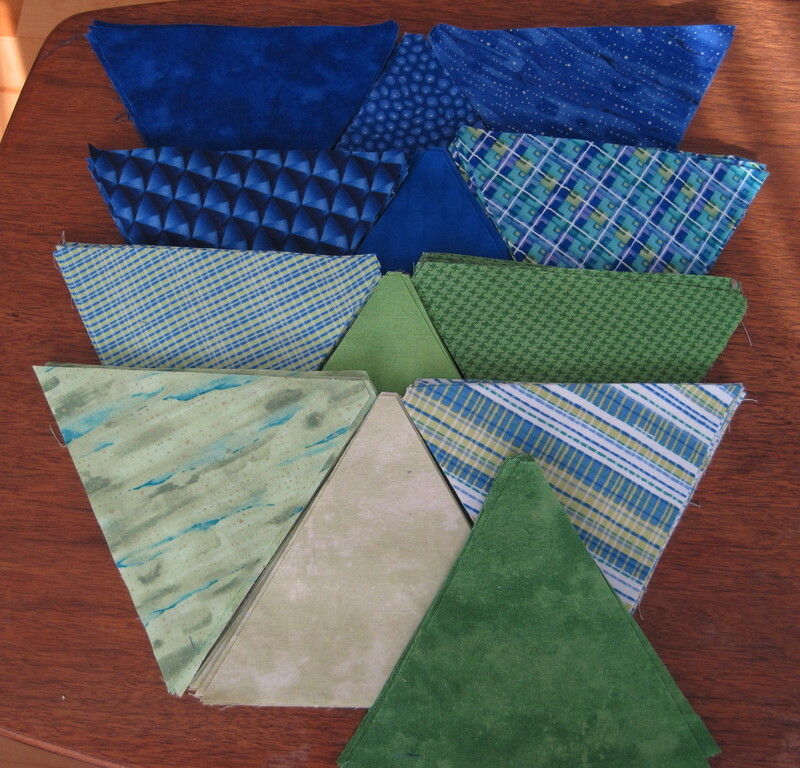 I threw all the triangles into a pile and mixed them up. 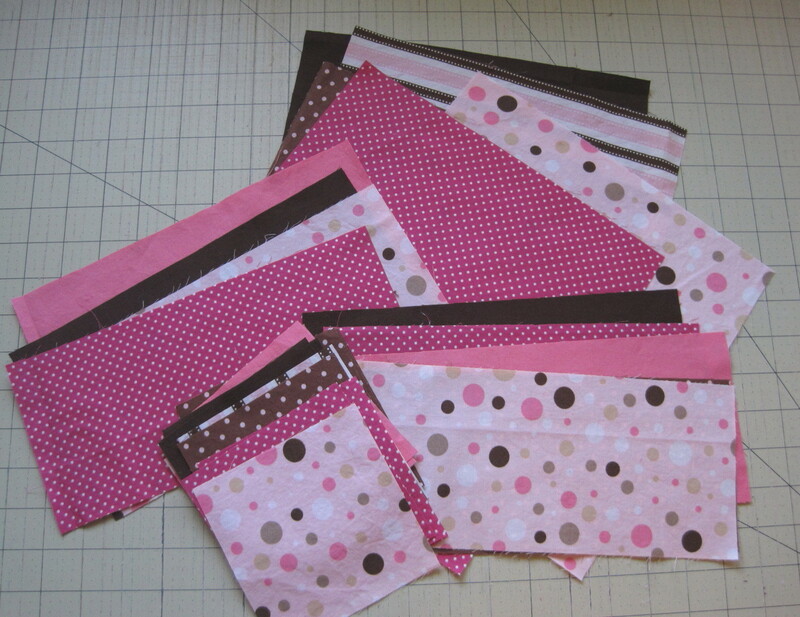 I'm going to sew them in groups of two and then sew the two's together and so on. 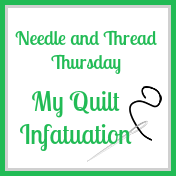 Linking up for ALYOF for my September goal.